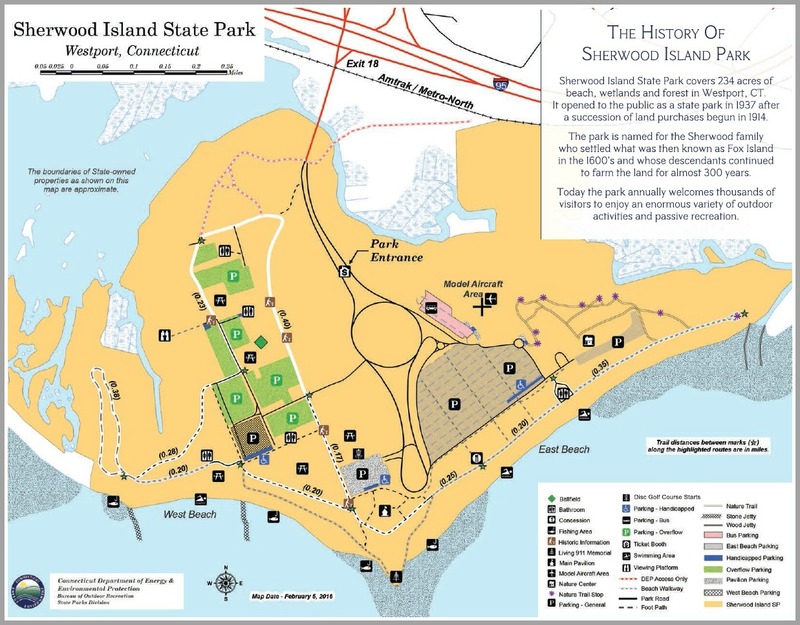 Sherwood Island — Connecticut’s 1st state park — covers 234 acres of Westport’s finest beaches, wetlands and woodlands. But — except for some very dedicated Friends of Sherwood Island members, and a few folks who make it their own special playground — it might as well be in Westport, Massachusetts. Or Westport, New Zealand. The isolation cuts both ways. I bet the only bit of Westport that 99% of all visitors know is the brief stretch of the Connector that gets them to and from I-95. The other 1% are people who miss the ramp, and end up mistakenly on the Post Road. Sherwood Island State Park — right here in Westport. If Matthew Mandell has his way, that will change. As executive director of the Westport Weston Chamber of Commerce, he’s all about promoting local businesses. He sees 500,000 people get off I-95 each year, with the sole aim of visiting Sherwood Island. But how to get those potential customers to see Westport? This week, 40,000 copies of a handsome brochure will be delivered to Sherwood Island. The tri-fold includes a brief history of the park; a detailed map, showing fishing and model aircraft areas; the Nature Center and 9/11 Memorial, bathrooms and more. QR codes take users to a map of Westport, and the Chamber’s restaurant and visitor guides. Park-goers will see there’s far more here than just a highway interchange. A detailed map forms the centerfold of the brochure. The brochures — produced in conjunction with Friends group — will be distributed free. 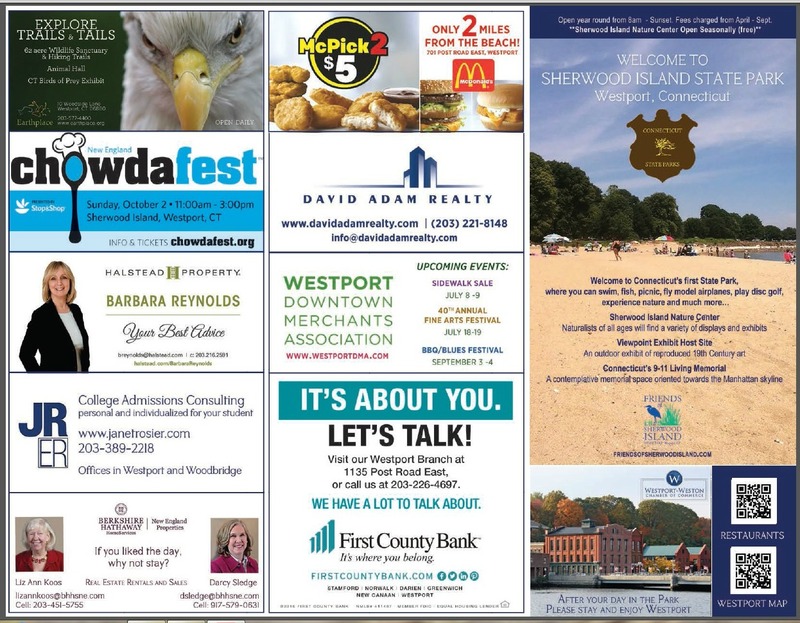 Ads — from Earthplace, realtors, a college counselor, bank and McDonald’s (“only 2 miles from the beach!”) — cover the cost. Westport Downtown Merchants Association president Randy Herbertson did the graphics gratis. Connecticut’s Department of Energy and Environmental Protection loves the concept. Now they want other communities with state parks to produce their own maps. It’s a win-win: great for local merchants, and for visitors looking to do more than just drive in and out. Who knows? If it’s successful, maybe the Chamber can do another map next year — for all the out-of-towners who have discovered Compo Beach. This entry was posted in Beach, Environment, Organizations, People, Places and tagged Friends of Sherwood Island, Matthew Mandell, Sherwood Island State Park, Westport-Weston Chamber of Commerce. Bookmark the permalink. Shocking that Matt would want some of those 500,000 people to actually turn north and clog the streets of Westport given how anti-traffic he normally seems to be. Of course, he helpfully limited any real information to those tech savvy and, presumably, upscale folks that have QR code readers on their smart phones. Anyone else probably couldn’t afford most of the restaurants and wouldn’t really want them wandering around the town anyway. Let’s keep working on that bubble. Seriously, nice in concept but a map of Westport highlighting downtown, the Minuteman statue, Saugatuck, Earthplace, etc. (even with just a QR code for restaurants) might have been more helpful to the masses that might want to wander into Westport than a map of the park. Eeeek! More people to discover Compo Beach? The Chamber may have found a winner!